Lots of open dates in Dec and Jan - Message owner rather than rely on VRBO calendar. Welcome to Hacienda Salsipuedes!! (translates as 'Leave if you can!') 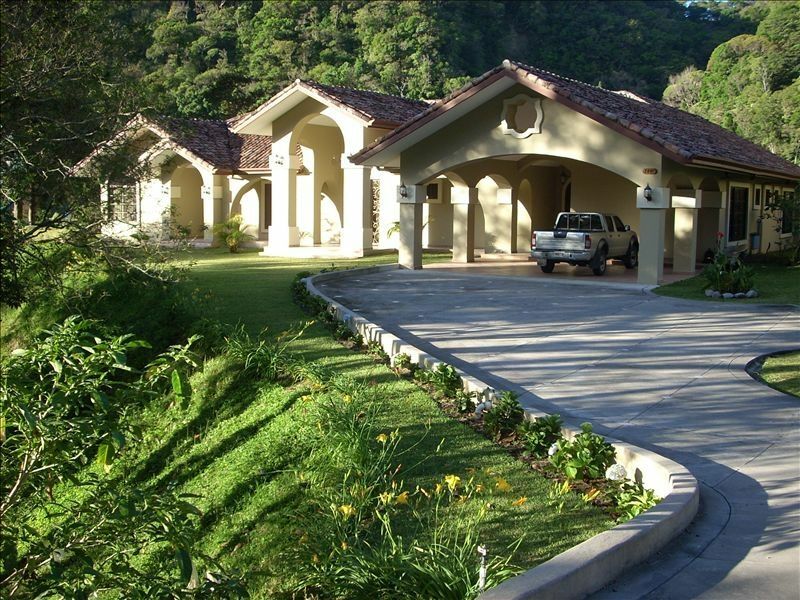 Consider that you can reserve this private home with fully stocked kitchen and huge patio with open views in the secure and quiet subdivision of Valle Escondido for a better stay and costing less than rooms in a hotel. Prepare a few meals instead of dining out and add to your savings. We love to start our day with fresh brewed local estate coffee, toasted bakery bread from the Belgian Bakery, and a fruit salad of sun-ripened papaya, mango, banana, pineapple, with fresh yogurt from the area. Eggs, sausage, bacon, ham as well as lunch and dinner items can be found at one of the several local supermarkets and deli's. Good cheeses, local and imported, very acceptable wines (especially Malbecs from Argentina under $10) and some spirits are available. A truck brings fresh fish from the Pacific to the local farmers market in big coolers of ice daily. Even shopping is an adventure! Boquete and the western highlands of Panama have been a destination for adventurous Europeans and savvy Americans since the 1920's. An agricultural area, the farmers here send coffee, vegetables, fruit and cut flowers from the Chiriqui district to restaurants, shops and homes all over the country. The microclimate and soil on the many fincas near here consistently produce award-winning, delicious coffees. Some growers are under contract with Starbucks, others will give you a tour of their operation from bush to roasting. Fascinating! Tourism and Retirement Living are growing market sectors, but the area is still largely being discovered by visitors. We have found the merchants in Boquete and the larger city of David, pop. 50,000 to be welcoming and courteous, always doing their best speaking English when our Spanish runs out. Our Panamanian neighbors in town are always helpful and enthusiastic about the beauty and history of their Chiriqui home. Valle Escondido, a gated, 9 hole golf course neighborhood, is just a short walk (15 min) from the small, bustling downtown area in Boquete. For us, a day of hiking, shopping or birding usually finishes up with a cool drink along the river somewhere where we ponder our choices of Italian fare (Il Pianista), American-Familiar (Bistro Boquete), Peruvian seafood (Delicias de Peru / Machu Picchu) or charcoal-seared steak from the Argentine parilla. For fun, add zip-line tours, river rafting (class II up to IV+), horses or rented ATVs to your To-Do list. Or just put your feet up on our large terrace and enjoy a cold, handmade pina colada as you take in the view across the valley with the Quebrada Grande stream chuckling below. Spanish lessons/tutoring are offered by a couple of small schools who can evaluate your starting point and move your personal abilities forward. This home is perfect for one or two couples, or a family group of 4-8 as the Master and Guest bedrooms each have a private bath. Traveling with teens? They can have some privacy. Infant? There is a playpen which doubles as a sleeping crib. Close to town, yet away from traffic in a secluded and private corner of Valle Escondido, you will enjoy a nice combination of convenience, privacy and quiet. Email with specific questions and, once you have made your reservation, peruse our orientation guide with info on Boquete / Volcan / David areas, details, photos and activities. This home was built by us with another couple as a winter getaway, NOT as a rental, but our work schedule intrudes on our traveling this year, so we are sharing it via VRBO. Allow more time than you think you will need. There is lots to do (or not do). We absolutely love it here and daydream often about our next holiday, living in Hacienda Salsipuedes. This photo was taken on a hike of the Sendero de los Quetzales around the north shoulders of Volcan Baru in January. Next time we will arrange to have a vehicle on the other end of the trail so we can walk all the way to Cerro Punta, have dinner at the Quetzales Inn, then drive back to Boquete by way of Volcan. Breathtaking primary rainforest, chuckling streams and a mirador (overlook) about 2/3 of the way to the other side. This walk is rigorous with some hands and feet climbing but the path is somewhat marked and there are other hikers to talk with. For healthy walkers 3.5 to 4.5 hours from the ranger station on the Boquete side to the village in the next valley. What a nice winter break from the cold, brown prairie around Denver, Colorado!! Still on our list of Things To Do Next Time: Hook up with the group Boquete Birders for local birding walks - Zip line canopy tour, petroglyphs and hot springs near Caldera, rafting (class II is sufficient, thanks), blue water fishing and island hopping on the Pacific, white sand beaches about 2hrs drive at Las Lajas, dining in the cliffside palapa at Isla Boca Brava, visiting El Valle the village built in a volcano crater on the drive from Panama, 5 day Hike/camp in treehouses from Cerra Punto over the divide and down to the Caribbean plains, ride the open air banana train to Almirante, catch a clear day at the summit of the volcano to see both Atlantic and Pacific Oceans at once, river fishing, river swimming, boating in Gulf of Chiriqui, seeking out live music venues. To Do AGAIN! More birding, Orchid Plantation (Finca Dracula! near Volcan) more snorkel and scuba in Bocas, more ATV exploring, more horses, more golf, walking tours in the back trails of Dolega and the entire Boquete valley, more dinners with friends, old and new, out to restaurants as well as dinner guests right here in the comfort of the Hacienda. Borrow a couple of guitars and invite other musicians...whew! And we MUST remember to include down time for just sitting and enjoying the house, its gardens and awesome setting. Quiet time is a funny thing to put on a To Do List but if we don't, it will surely get displaced. Town center of Boquete is a 4 minute drive or 15-20 minute stroll. Taxi home from downtown is a couple of dollars. Walkers get along fine with renting a car locally for a day or two as needed. For an additional $50pp registration fee, guests may use Social Membership at the VE Country Club. Includes tennis, mini-golf, indoor pool and jacuzzi, steam, racquetball, weight room, classes. Boquete offers one huge supermarket and several modest sized. A dozen restaurants serve International cuisine at first world prices. Local comedors offer comida tipica and $1.00 beers. Lovely! Mature trees & views across the valley and to the river below. Sections of golf course visible from different parts of the property, but not from inside the home. The views across valley are outstanding. Daybreak paints the entire opposite valley wall with orange and pink on the greens of the canopy. Smashing! Home is set in the rolling hills above Boquete. guests can bring a MagicJack that can be plugged into an the USB of their own laptop. This gives you a US phone no. Test this before leaving the states. Or have your cell carrier set you up. Electric fireplace with heat for chilly evenings. DSL level service by CableOnda with wifi in the home. Estimated speed (currently upgraded) is 10-15 mbps. Nearby Country Club has gym. Membership is included after $50.00 one time registration fee per guest. Fitness / Workout room, classes, racquetball, pool, jacuzzi, sauna, steam, mini-golf, tennis. Open wifi in the home has good connectivity. Speeds vary with level of users on the overall network. But email and browsing work fine. Skype and MagicJack quality not guaranteed. CableOnda is the cable provider. Some English stations with added Spanish stations so you can brush up on vocabulary while you relax. CD player also has 3.5mm mini plug in. Bring an extra patch cord recommended in case ours is missing. DVD's can be rented in town. Note that some streaming services like NetFlix will not work on a foreign IP address. Amazon now allows downloading of movies from your subscription before you leave. small orchard with fruit trees below south wing of home. Guests can share any fruit that is ready. Private patio and covered deck plus shared covered veranda. at extra charge. Pro shop is down by Cantina. Home is all on one level with only a small step from carport up to front porch. Indoor Pool at Country Club. Same as gym. Membership is paid, only need one-time registration of $50.00/person. See fitness Room language above. WiFi zone in the house works well. Bring your laptop or iPad. Golf Pro Shop also rents Internet and computer time about 5 minute walk from the house, plus there are several CyberCafes in town. Ask for details about guest use of the Country Club indoor pool, workout room, steam, sauna, classes, massage on-site. Valle Escondido is a lovely location. A gated community with a hotel, restaurant, cantina, tennis, golf, etc. The properties are lovely, with beautiful gardens, streams everywhere. The rental property is as described, but needs some more maintenance. The property owner is very responsive and helpful. Boquete is a lovely area to spend time in and we enjoyed ourselves tremendously. Thanks for enjoying our home for your stay in Boquete. The paint and maintenance items you let us know about are being taken care of. You all are welcome back anytime. We had an amazing stay in Bouquet. All was great. Place well equipped and clean. Thank you Jiri, you and your family are welcome to stay at our hacienda anytime. We had a great time in Boquete and enjoyed the house and amenities. The house is comfortable and has a well provisioned kitchen. The property manager was very friendly and helpful. Thank you for the nice review. We love the home and look forward to our next visit. In the meantime, we enjoy sharing Boquete and the hacienda with other travelers. Safe journeys! Thank you Jennifer, you and your family are welcome anytime. Glad you spent your Christmas holiday in our home. A perfect stay, beautiful house, great location! We had a very comfortable stay in this beautiful house in the middle of the hills of Boquete. It was well equipped, plenty of space, comfy beds, lots of big windows and doors for the fresh mountain air to breeze through. There's a lovely big terrace and garden to have meals in or simply sit and watch nature. It's about a 20min walk into town but a very quick drive. The house is on a great resort which has a wonderful spa/pool included in your stay as well as the option to play golf. 2 nights in this place was not enough, I could have stayed all week! tranquil and an escape from reality. I spend roughly three months each winter in Boquete and always in Valle Escondido. Because of the length of time I am there I look for a nice comfortable home. This one fits the bill just fine. Owners are great and local manager is very helpful. Ten minute walk to town. Thanks for your feedback and for your help with suggestions to keep the home in good shape for future guests. We hope to see you in years to come. Birdwatching Tours - The rare Resplendant Quetzal is sometimes seen January-March, also Coffee Finca and Production Tours, Zip Line Canopy Tour, ATV Rentals for area riding. Horse rental available. On the Pacific coast, there are deep sea fishing charters, surfing, beach fun. Fresh water rivers are stocked with trout, check license requirements. A car can be rented in Boquete area for $40-50/day if you only want to explore for a few days of your visit.